The NPort Z2150 is IEEE 802.15.4/ZigBee compliant, providing a reliable wireless solution for serial-to-ZigBee networks requiring minimal wiring presence. The NPort Z2150 can be configured as a ZigBee coordinator (ZC), a ZigBee router (ZR), or a ZigBee end device (ZED). 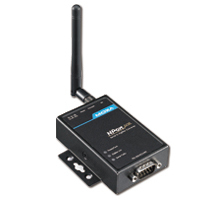 Any serial device can be connected to the NPort Z2150 and exchange data via PAN. An user-friendly utility is provided to configure the device type and network settings in simple steps. The following figure shows a typical topology of a ZigBee network.